- Introducing Our Stylish Cuboid Hummingbird Feeder that will easily attract Birds. ☑ Easy cleaning - We make a detachable lid for easy cleaning and refills at the same time, so virtually insects cannot enter inside easily. ☑ Built-in ant moat and bee guards - Good barriers for small insects like ants, bees, and they don't have the chance to eat the nectar inside the box. ☑ A perfect gift - An excellent gift for your lovely grandparents, friends, partner or to anyone in your life who loves Nature. ☑ Multipurpose - You can now transfer Cuboid to your window or put it outside in your garden. Use our window suction cups or hanging clamps. 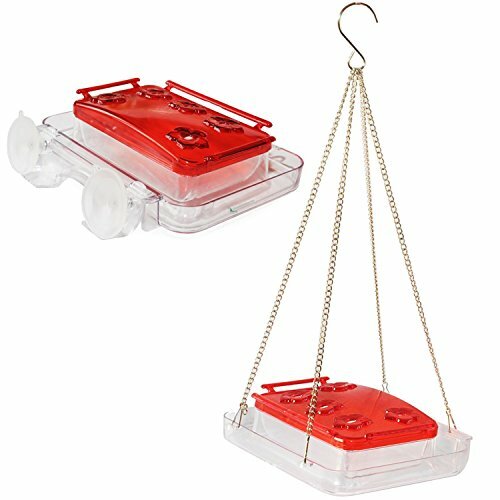 ☑ Convenience - It is designed with a sturdy perch for the hummingbirds to rest comfortably while eating, so they will come every day in your place. ☑ The best quality on Amazon - Made by the best material on the market that will never break easily or melt, and it is spill-proof and weather resistant. ☑ Modern - This is the newest design on Amazon, a cube box with red cover lid and flowery holes to attract birds. ☑ Value pack - It's not just a simple box, it is completed feeding hummingbird feeding kit including a free cleaning brush. ☑ Stress reliever - Feel the nature close to you and take out all your stress! Why wait? Press ADD TO CART now, to get your Sherwoodbase Cuboid Hummingbird Feeder rushed to your door now! ✔BEST HUMMINGBIRD FEEDER - Our Hummingbird Feeder is made of high quality materials will never break, or let you down unlike many other Hummingbird Feeder brands here on Amazon. We offer Lifetime Warranty! ✔BUILT-IN ANT MOAT, BEE GUARDS PROTECTION - With Cuboid you never have to worry about insects that will invade your Hummingbird Feeder. It's well protected from ants, bees and other small insects. ✔IDEAL FOR ANY HOME - Cuboid is good for any kind of real estate. It is ideal for any house, condo or apartment. It's an additional decoration in your home at the same time as a stress reliever when you see the colorful hummingbirds in your place. ✔EASY CLEANING - Detachable lid makes cleaning and refilling super easy for you. Your Hummingbird Feeder will always look like new if you take care of it. ✔LIFETIME WARRANTY - It's backed by our unbeatable Lifetime Warranty and 30 days money back guarantee. If you have any questions about this product by Sherwoodbase, contact us by completing and submitting the form below. If you are looking for a specif part number, please include it with your message.